Darth Vader Annual #2 takes time to hand the Dark Lord of the Sith over to a new writer and art team to tell a one shot story. Author and comic writer Chuck Wendig returns to take on this Vader story set on Scarif. It’s a very interesting story as it has Darth Vader studying the details for Project Stardust while an enraged Tarkin finds the gall to claim authority over Vader. Presumably this is where Vader learns what the Death Star is and its true scope. Here’s the thing…I’m not sure how well this story fits into James Luceno’s book Catalyst, or even Tarkin. I’m also not sure how it fits in with the end scene in Revenge of the Sith. In the movie, it seemed pretty clear that Tarkin and Vader were both in on the Emperor’s secret Death Star project. Yet this comic tries to make it seem like it was a secret being kept from Vader. This comic also makes it seem like Tarkin is naive enough to think he can just start bossing Vader around. Going off the books, the films, and even Star Wars: The Clone Wars, Vader and Tarkin had a pretty good working relationship. Wendig undermines that, or simply ignores is. Taken in isolation, the story is fine, but when you try to integrate it with the stories everyone else has told, it doesn’t mesh very well. On another level, this is a story we’ve already seen before. 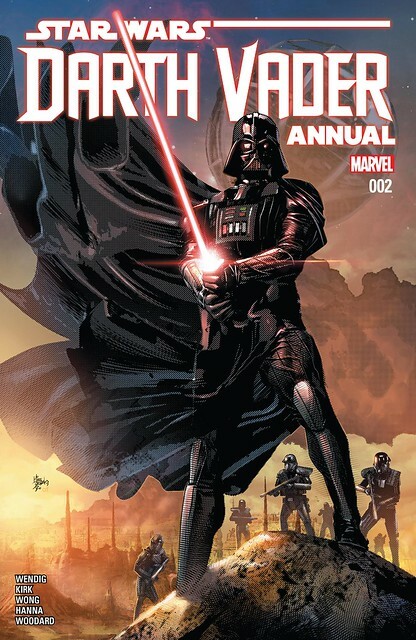 Marvel already did a Vader comic with him fighting a rogue Geonosian queen and slaughtering her. And there’s nothing really new about Imperial officers squabbling with each other in their own power games. Seeing Tarkin and Krennic doing more of the same here, overlapping with some of the events in Catalyst, but throwing Vader into the mix, isn’t very rewarding. At least I didn’t find it very rewarding. It’s ground that’s been covered a lot elsewhere, so I’m not sure what Wendig was trying to achieve in this story. I don’t recall any missing pieces in Catalyst or Tarkin that this rectifies or plugs in. It just feels like an awkward interjection of Vader. It doesn’t help any that the artwork is very cartoonish and simple in style. The coloring is good, but the artwork makes it feel like a comic for kids. Some of the panels are better than others. In fact some of the panels are good. But there are a lot that are very cartoonish, exaggerated, or lacking in detail. Even the cover is disappointing with a very old school dot coloring that looks terrible. With a not so great story, and not so great artwork, this comic is totally skippable. It has no relevance to the current Darth Vader series, and no real importance to the overall Star Wars saga. I give it a two out of five metal bikinis.